What Do You Love About a Biker Bar? Last week, GothRider took you on some of the best motorcycle rides in the Northern United States and gave you some great dive bars to stop at along the way. This week, we’re heading West to give you the best scenic rides for bikers in California. If you head west from Red Bluff along Route 36, you will see a sign promising twisty roads for the next 140 miles. You and your bike will practically be on a roller coaster all the way to Fortuna, California. 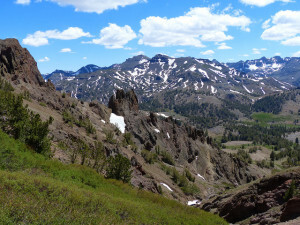 The ride includes intense elevation changes and a trip through national forests. The views at the top of the higher elevations are incredible. This is really a trip for experienced bikers: the road twists are unpredictable, and there are many long drops with no guardrails. However, the roads are well-maintained. Expect to travel the whole 140 miles without many stops. There is little cell phone reception, and only a couple places to eat and fuel up along the way. Stay in Fortuna or a few miles up the road in Eureka on the coast. This scenic route was dubbed an “All American Road” by the U.S. Department of Transportation. For 127 miles from Monterrey to just outside San Luis Obispo, you could easily schedule a week’s vacation. If you drive straight through, however, you will be staggered by the scenery. Heading south, your right side will feature beautiful coastal views for the entire drive. 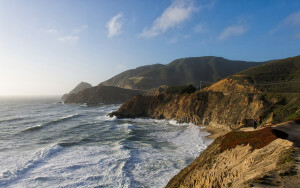 On your left, the scenery changes from mountains to valleys and waterfalls to redwood forests. There are historic Spanish missions and an abundance of sea life. You’ll pass seven state parks, plenty of museums and shopping, and end at William Randolph Hearst’s mansion. Due to the popularity of the drive, the route and roadside attractions can often be congested. Go in the off-season to avoid some of the traffic. It’s still one of the most scenic routes in America, so the ride is well worth the traffic. About 30 miles southeast of Riverside lies Hemet, California. From Hemet, Route 74 takes bikers through a varied scenery, ending near Coachella Valley. The best of the road stretches for about 50 miles. The ride starts out with pine forests just outside of Hemet. The elevation climbs through mountains and ends in desert. 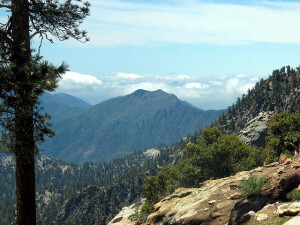 Be sure to stop at the Santa Rosa and San Jacinto Mountains National Monument before the end of the trip. There’s not a lot of places to stop along Route 74. If you’re up for a detour, follow the signs to Idyllwild for gas and good food. Highway 58 is a little hard to find, so take your map and don’t rely on the locals. Head west from Bakersfield for about twelve miles. The route really picks up as a highway in Buttonfield, just west of Interstate 5. Once you find it, you and your bike will be on 90 miles of nearly perfect solitude. The elevation changes throughout farmland. Then you’ll hit winding, twisting roads in Calf Canyon. The ride ends just north of San Luis Obispo. Make sure you leave with a full tank of gas. There are few places to stop and even fewer vehicles on the road. The solitude and scenery are refreshing. Sonora pass is arguably one of the most beautiful rides in the country. Heading east from Sonora on Highway 108, the Sonora Pass goes for 79 miles until the small town of Sonora Junction. Even at the end of summer, the mountain peaks still contain snow. You’ll pass mountain meadows full of vibrant wildflowers and wildlife. There are old forests and waterfalls on every side of your drive. This is a ride for an experienced biker. The mountain road is steep, narrow, and winding with many drop-offs. This road is closed in the winter, so make plans to be there in the summer. There are few places to stop along the way, so gas up before leaving Sonora. What Should You Think About While Planning Your Motorcycle Trip? What Type of Motorcycle Helmet Do You Prefer? American Chopper: Where Are They Now?